The Hetzenberg Chronicles: The Ironclads! From L - R: USS Canonicus, USS Monadnock, & USS Lexington. From L - R: CSS Manassas, CSS Virginia II, & CSS Gaines. Just for a change from Hetzenberg, here are some of the American Civil War Ironclad models used at our club in New Buckenham. 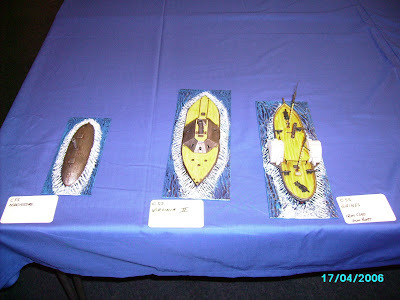 The vessels are resin models from Old Glory built and painted by Paul Cotton, and are scaled at 10mm. A note to purists - some of these ships never saw action in real life. For instance the Monadnock was completed, but was used as a floating battery because her three turrets made her unweildy. On the original plans she was scheduled to have four but reason prevailed. The Virginia II was one of many Confederate Ironclads burnt on her slipway to prevent capture by the oncoming Union army. Our games therefore have more than a whiff of what if... about them. "Anything but a 19 or 20!" The only Confederate survivor was the CSS Gaines, ironically the lightest armored vessel in the squadron. She handed out useful damage to the Canonicus, without suffering much in return. With her squadron mates sunk, she decided discretion was the better part of valor and withdrew. Perhaps she should be re-christened the CSS Falstaff (he of the valor/discretion quote from Shakespeare's Henry IV, Part 1). Loved the ironclad models. It's cool to do a "what-if" alternate history scenario, isn't it?